If you're staying in France for more than a week or so, a prepaid phone (aka a burner phone) can be enormously helpful and not too expensive. It can really come in handy staying in touch with the people traveling with you, making dinner reservations when you're out and about, checking in back home, etc. Now, if you're only staying a few days, you might as well just get international service turned on for your regular phone plan, but that can get ridiculously expensive after a while. This website is mostly about my own experiences here in Paris, so I haven't really gone out of my way to be unbiased and explain every option that exists. I'll simply tell you about my own prepaid phone service here, and you can investigate others if you want. I suspect they're all really about the same in terms of quality and cost. Getting your prepaid phone is easy, but if you don't speak French it might be a little tricky. If you start out in a big electronics store in the middle of Paris, there's a better chance you'll find someone who speaks enough English to help you through the process. Two big electronics chains are Darty and Fnac. Both have many locations throughout Paris and the rest of France, and they both have big cellphone departments. 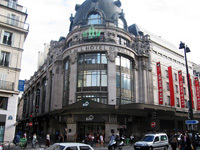 There's a huge Fnac in the Forum des Halles, which is a big shopping mall in the Les Halles neighborhood of central Paris. And there's a Darty just on the south side of the Rue de Rivoli, a big shopping street that runs through central Paris. There are many more locations for each of these chains all over the city, so you might want to check to see what's in your neighborhood, or just head to the center of town and find one of these. Of course, there are other chains and other independent stores that have cell phones, but these two are among the biggest and easiest to find. Once you find someone who speaks a little bit of English, explain that you want a prepaid phone. You'll need to buy a cheap phone and open an account for the prepaid service. The phones usually start at around 29 euros, and they're all equally functional, even if they might not be that pretty or have a lot of bells and whistles. To be clear, we're not talking about smartphones here; this will be a cheap little flip phone that lets you make calls and send texts. No internet, maps, etc. The prepaid provider I've mostly used is called SFR ("ess-eff-air"), and their prepaid service is called La Carte, often written as La Carte SFR. So if you just want to do the easiest thing and not shop around, you can just ask for specifically for La Carte SFR. Each prepaid service provider is compatible with certain phones, so the salesperson will show you the phones that will work for that service, like SFR or any of the other ones. Like I said, you can just take the cheapest one that goes with that provider, since you're probably going to toss it or give it away at the end of your stay. The salesperson will take your name and address to set up your account; you can just give them the address of where you're staying, or maybe you can tell them you don't have an address; I'm not sure if they can complete their form without one. Once you pay, they may set up your phone for you, or they may just give you everything in a box and you'll have to set it up yourself. It's really easy; there's a small SIM card that needs to go in your phone, and that's basically it. Your phone number will be written somewhere, either printed on your receipt or written by hand by the salesperson, so make sure you locate that. Your phone will probably come with about five euros worth of credit already in it. It's ready to use! Your phone will have French as its default language, but you can definitely set it to English. Ask the salesperson to do this for you, or if you've already left the store, you can certainly figure it out on your own. There are so many versions of the menu options that exist in these phones, it's impossible for me to tell you what French words to look for, but once you're in the right menu, the language will be under Langue, and of course you want to select Anglais. The trick is simply finding out wherever the Langue options are hiding. Poke around and you'll find it! You won't break anything. See my article about le tabac here. 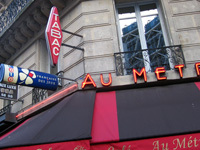 The word Tabac, meaning tobacco, refers to a tobacco shop or the tobacco counter at any bar. This is where French people buy smokes, as well as lottery tickets, phone cards, etc. Not all bars have a tabac, but the ones that do are easy to spot: they always have a big red diamond-shaped sign out front with the word Tabac on it. Almost any tabac you go into will have your brand of phone coupon, and if they don't, you can simply go to the next one. The language barrier might be a slight challenge in getting your coupon. All you need to express is which brand of phone you have, and how much credit you want to buy. So you can try asking in French, for example, "Je voudrais un recharge SFR pour vingt euros, s'il vous plait." But if that's too much French for you, there are easier ways. The brands of prepaid phone companies are usually displayed on the front of the glass counter. You can just point at the logo, hold up your phone, express how much credit you want with fingers or by jotting it down, or any combination of this sort of verbal and non-verbal communication. The Tabac person won't bite you, and you'll be proud of yourself for getting through this interaction! This is some junk you can brag about to your dumb friends back home. The coupon you buy could come in one of two forms: Sometimes it's a plastic card, the size of a credit card, with the logo of your prepaid provider and a scratch-off silver strip hiding the code number for your credit. These come in specific euro amounts, like €5, €10, €20, etc. Sometimes, instead of a card, the person at the tabac counter will print out a long receipt-like paper, and that's your credit. You can get these in any amount at all, and both the card and the receipt are equally valid and work in exactly the same way. There's tons of small text on this receipt thing and it can be a little intimidating, but all you need to find is the phone number to call (probably just three digits) and your long code number to enter for your credit (probably around ten digits). To actually apply the credit you just bought to your prepaid phone account, you'll have to dial a free number to access the system, and then punch in the long number on the coupon you just bought. This service will be in French, unfortunately, which may pose a big challenge. If the Tabac guy was nice, why not ask him to do it? I'm sure anyone would be happy to do this for you, even a waiter in a cafe, or certainly the concierge at your hotel. If you happen to be using SFR, I can tell you the exact process, so you don't need to understand anything in French, and the system is automated so you never have to talk to anyone. For SFR, the number to call to activate your credit is 952 (i.e. dial 952 and press the call button, usually the green one). When the recording of a French lady's voice starts playing, press 1 to indicate you want to enter your credit. Wait for the lady to start talking again, and you can enter your code right away. Press pound (#) when you're done. The lady will tell you that your credit will become available in a minute or two. You're done! You can also recharge your prepaid phone online with your credit card, but the whole process will be in French, so you might be better off doing it with coupons and just getting someone's help. You can check your remaining credit at any time by dialing a free phone number and listening to an automated message (only in French, unfortunately). If you're using SFR, the number to call to check your credit is 950. If you know just enough French to know your numbers, you might be able to figure out what the message is saying. With SFR, the lady says, "SFR, bonjour. Vous disposez de [X] euros et [Y] centimes de credit [etc]." Basically, "SFR, hello. You have [X] euros and [Y] cents remaining." When I first started using my phone and my French was pretty bad, I'd just hang up and call back a handful of times until I understood whatever number she was saying. Last time I used SFR, I wanna say text messages within France were 10 centimes, and phonecalls within France started at one euro for the first minute; something like that. Text messages to the US from France cost me about 35 centimes, and I tried to never call the US from France because it would certainly be very very expensive. 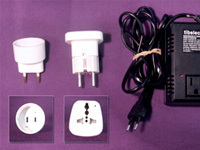 If you're doing a multi-country trip, your phone will work in all or most European countries. When you arrive in a new country you'll automatically receive a text message welcoming you to the country and telling you what provider your phone will work with in that country. SFR doesn't exist in every country but each country has another provider that will take its place and sell you credit for the duration of your stay. I remember Vodafone being one that came up pretty often when I was traveling. So, when you need to buy credit in that country, whatever brand was in that welcome message is the one you want to look for. When you buy your credit, it will last a certain number of days, depending on how much you buy. For example, with SFR, I always keep in mind that their 15-euro coupon stays good for 30 days once you've activated it, but the 25-euro coupon stays good for 60 days, so if you know you're staying for a while and you don't use your phone a lot, the 25-euro coupon is a better value. I've often arrived at the expiration date with credit left over, so I've lost money sometimes that way. So for my phone-using habits, a coupon with a longer expiration date was the better choice. But if you're only staying for a week or two, the expiration date probably won't be a factor at all. When your stay in France is over, one option is to simply throw away your prepaid phone. But if you or anyone else you know will be traveling to France in the next year or so, you can keep the phone and either use it yourself again the future, or give it to a friend who's coming to France and let them reactivate it when they arrive. Most prepaid accounts will be terminated if they're not used for a certain period of time, sometimes three or six months (I believe it's six months for SFR). So if you or someone else comes back to France just a few months later, you can just buy a new recharge when you arrive, activate the credit, and the phone will still work, and it'll still have the same phone number and everything. If you come back to France many months later and find that the prepaid account has been terminated, you can simply get a new account. You'll have a new phone number, but you can still use the old phone, so there's no need to buy a new one. All you'll have to do is stop in at a store that sells phones for your particular prepaid service and explain that you already have a phone for that service but the account has been terminated and you'd like to start a new one. They'll sell you a new SIM card for the phone, and they might remove the old one and put in the new one for you, or you might have to do it yourself (it's easy!). You'll receive a brand new phone number for the new account, and you're ready to go. Note: when you get rid of the old SIM card, you'll lose whatever information you had stored in the phone previously (like phone numbers, text messages, etc). I wrote this article back around 2010 and everything is still pretty much the same now (2015). I've come to learn that the SFR recharge cards I described above are now called Recharge Classique, and they have a new type of card called Recharge Illimitée (unlimited). These come with unlimited calls and texts within France but are a bit more expensive and last for fewer days. I haven't used the Illimitée yet and I will probably just stick with the Recharge Classique when I'm in France. I mention the other one in case you're buying a Recharge and are faced with the two options. You probably can't really go wrong with either one. I guess one nice thing about the Illimitée is that you don't have to call and check your balance; just remember how many days you have. After a long hiatus in the US I came back to Paris and realized I'd forgotten my trusty SFR phone, so I went into the first mobile phone chain I saw, Orange, and bought a new prepaid one. They had the cheapest phone I've ever seen; it was just 19 euros! Everything else about the whole setup was basically the same as for SFR, although I don't remember the specific phone numbers you'd need to dial to add credit or check your balance. Most tabacs will sell credit for both SFR and Orange, so they're both very practical options. I'm sure there are other equally good brands too, I've just never used them.